Another pun over there! Looks like its a day for puns! Poor McGain…gets a debut just a week before his 37th birthday and gets launched into the stands by none other than Kallis! He’s already conceded 93 off his 10 overs. But I generally hear that leggies do give away quite some runs early in their career and that captains have to persist with them. However, from what I have seen, Ricky doesn’t always seem too keen on taking a specialist spinner into the side ever since Warney retired, so there is a possibility that McGain might not play in the Ashes if he continues like this. Just hopes that Punter punts on him and it works! Finally, Hilditch has found the syringe! Finally, you’ve injected that thing known as ‘young blood’ into the beast ‘Australian Cricket’, without which it may have died a sad death. Another important injection is ‘proper spinner’, which was also vital for the beast to function. However, Hilditch has also stuck to the item ‘middle-aged players’ and knocked some of that in too! Anyways, quite a squad that has been announced, I have to say! 4 uncapped players in quickie Ben Hilfenhaus, leggie Bryce McGain, opener Philip Hughes and 29-year old batsman Marcus North. McGain and Hughes are certain starters in the XI. 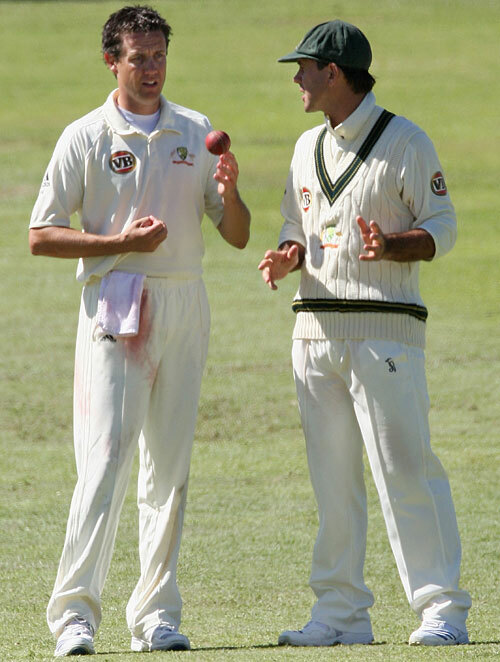 Phil Hughes must be the youngest Aussie debutant since, perhaps, the skip Ponting himself! McGain will become the oldest debutant since the 38 year old Bobby Holland @ 36 years. Another stat for you. 8 of the players in the 14-man squad have a combined test experience of 10 tests. Total is 228 with Ricky, Pup and Hussey taking up at least 180 of them! The squad is as follows. Phillip Hughes, Simon Katich, Ricky Ponting (capt), Michael Clarke, Michael Hussey, Marcus North, Andrew McDonald, Brad Haddin (wk), Mitchell Johnson, Nathan Hauritz, Peter Siddle, Doug Bollinger, Bryce McGain, Ben Hilfenhaus.